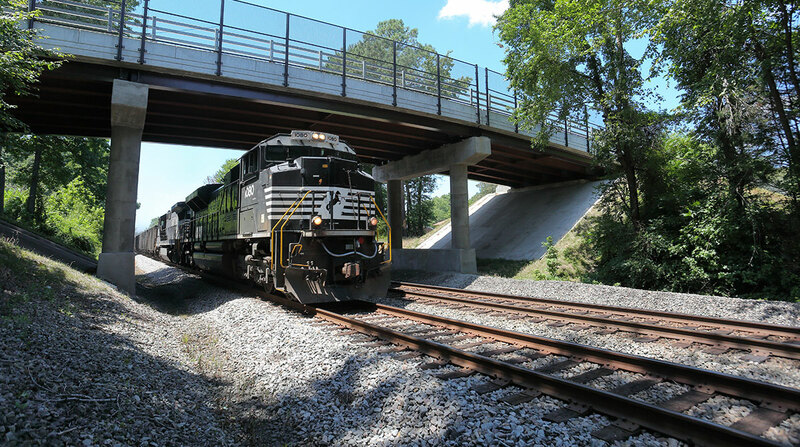 Railroad Norfolk Southern Corp. reported first-quarter net income of $552 million, up 27% from $433 million in the first quarter a year ago. Earnings per share were $1.93, up from $1.48. Analysts surveyed by Bloomberg had estimated earnings per share of $1.77 on net income of nearly $510 million. The Norfolk, Va.-based company attributed the boost in profit to a 10% rise in income from railway operations, to $835 million from $757 million, and a lower effective income tax rate. Operating revenue rose 6% to $2.7 billion from $2.6 billion a year ago. Overall volume rose 3%, as growth in the intermodal division overcame declines in the merchandise and coal divisions. Operating expenses rose $64 million, or 4%, to $1.9 billion due to higher fuel prices and other costs. Norfolk Southern reports on three major divisions — merchandise, intermodal and coal. The merchandise division recorded operating revenue of $1.6 billion, up about 1%. Revenue at the intermodal division rose nearly 19% from $571 million to $678 million, and the coal unit saw revenue rise incrementally to $434 million. Norfolk Southern operates about 19,500 route miles in 22 states and the District of Columbia, and serves all major East Coast container ports.